Michigen based XG Sciences uses Michigan State University developed technology to develop and produce Graphene Nanoplatelets, or xGnPs. Those short stacks of graphene sheets made through a proprietary manufacturing process can be used to replace carbon nanotubes - at a lower cost. Michael Knox, the company's co-founder and CEO was kind enough to answer a few questions we had. During the previous 25 years, Mr. Knox has been involved in a number of different businesses as an owner or an officer. Mr. Knox has a BA in Economics and an MBA in Finance from the University of Minnesota. Q: Mike, thanks for agreeing to do this interview with us. XG Sciences are currently offering xGNPs and the XG-Leaf sheets. How are sales going currently? Can you tell us some applications that are using your products? Sales are going great. We have customers all over the world that are active in many different applications. 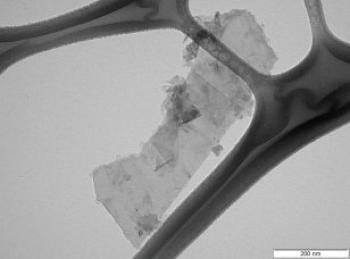 As you know, larger applications like automotive and aerospace take several years to make their way through the development pipeline and, remember, we have only been selling xGnP Graphene Nanoplatelets for a couple of years. In fact, we are one of the only companies with a sufficient commercial capacity to provide the type of supply-chain assurance that large companies need before adopting a product. Major application areas include polymeric composites, coatings, and energy storage. We have NDAs with most of our customers, so I cannot provide specific details. Q: A couple of months ago you launched a new graphene-based anode material for Li-Ion batteries. Any updates on that? Is that material on sale now? Yes, our silicon-graphene composite anode material is on sale and is being evaluated by about a dozen large battery manufacturers around the world. Since our material has a capacity of up to four times that of today’s regular anode materials, there is a range of possibilities for new battery designs that manufacturers can consider. Because of the really good cost-performance ratio, we expect to see production implementation for some customers within the next year. We are also working with several of the large consumer electronics companies who have laid-out new battery performance specs for their devices, and I expect these collaborations will help pull our materials through the battery manufacturers on a fairly fast track. 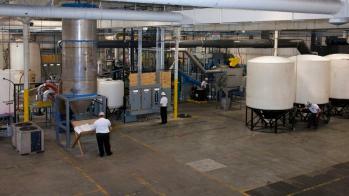 Q: In August 2012 you started production in your Lansing, MI 80 ton facility. Can you update us on that facility? Can you detail your current monthly output? We don’t give out details of things like our monthly production. We are happy with our decision to move to a larger manufacturing facility and we expect to be in a mode of adding to our production capacity and capabilities for quite a few years. We are currently adding to our production capacity for energy storage materials, for example, and we are looking for additional manufacturing partners in that area. Although graphene nanoplatelets are a new material, the application spaces are relatively well-known and some of the markets are quite large. The global market for anode materials for lithium-ion batteries, as just one example, is about 50,000 tons per year. Our relatively tiny production capacity is simply a small beginning on where we need to go. Q: In a recent interview you mentioned you have over 600 clients, a very impressive number. I'm guessing most of your materials go into research? How many of those are targeting commercial applications? When I last counted, we had over 600 active customers in 37 different countries around the world. About 20% of our customers are research institutions like universities, national labs, and government agencies. The rest are companies that manufacture things. As you can imagine, most of these companies need to do development with a new material. One doesn't read a scientific article on, say, thermal management using graphene nanoplatelets and then just dump some nanoplatelets into your application to make things better. Advanced materials require careful application development, and these development cycles take time. We have one automotive company, for example, that says they have “fast-tracked” our materials and are targeting for an introduction in model year 2017. One of the fascinating things about being a supplier of an advanced new material like our xGnP graphene nanoplatelets is that we have such a wide range of customers, with different applications. When I talk to scientists at some of our global customers where we have NDAs or research agreements, for example, I get a brief glimpse into their research programs as they apply to our materials. We have customers looking at applications in solar energy, sensors, printed electronics, self-healing composites, smart fabrics, 3-D printing, and all of the other applications one reads about in the scientific press. On the other hand, we have lots of customers that are completely secret about what they are doing. Also, there are customers that just order our material from time to time but with whom we have no real contact. Sometimes I wonder, for example, what the Indian Space Agency is doing with our materials. Q: Where do you see the graphene market in 3-5 years? Where do you think graphene will make the most impact? In the case of “graphene” there are really several different types of materials that get lumped together, each of which has its own future growth path and application sweet spots. True “single-layer” graphene produced through CVD or similar “bottom-up” processes still has many technical challenges that, when solved, will open up some huge markets. It is difficult for me to see that happening within the next 3 – 5 years. On the other hand, materials like ours, which are not single-layer materials but ultra-thin particles of carbon, have already gotten the basic manufacturing and cost issues resolved and are the subject of active product development programs in very large markets. If you include our “graphene nanoplatelets” in the overall graphene market, then I think you will begin to see some pretty large application areas developing. It is very easy for me to see the potential for XG Sciences’ existing customers, with known applications, to be using thousands of tons of materials in five years. Of course, that assumes they, with our help, are successful in their development efforts. One thing I have observed from looking back at other new materials is the slow but inexorable pace of progress in the materials world. If you look at past breakthrough materials like polycarbonate or "Gore-tex" or carbon-fibers you see slow but steady growth for years, usually accelerating when a tipping point is reached. The difficulty is in predicting when the tipping point will occur. All of these other materials eventually became billion-dollar businesses and I don’t see any reason why that won’t happen with graphene in all of its forms. Q: What do you think are the biggest challenges ahead for the graphene industry? I’m not sure what the graphene industry is. There are many small suppliers like XG Sciences that face the challenges associated with being a small start-up company. When you take all of the attendant requirements for financing, marketing, production, hiring, and sales management, and then layer on top the additional challenges offered by a new material that needs sophisticated development by very large customers that move at their own pace, you have to give credit to the entrepreneurs that are pioneering this new material. The biggest challenges for those of us in this space are simply staying alive and making progress toward self-sustainability. The challenges for the big companies that are looking at graphene as a replacement for ITO or silicon or other fundamental nano-scale applications are technical challenges related to cost-effective production and scale-up. I am sure these will be resolved, but it will take time. Mike - thanks again for your time. 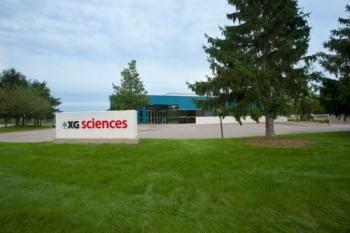 Good luck to both you and XG Sciences!